A dense-graded mix (Figure 1) is a well-graded HMA intended for general use. When properly designed and constructed, a dense-graded mix is relatively impermeable. Dense-graded mixes are generally referred to by their nominal maximum aggregate size. 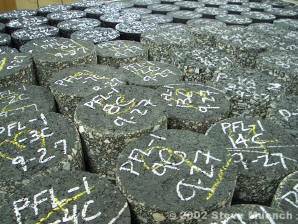 They can further be classified as either fine-graded or coarse-graded. Fine-graded mixes have more fine and sand sized particles than coarse-graded mixes. Dense-graded mixes are used extensively in Washington State for all purposes. 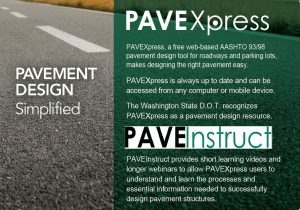 Purpose: Suitable for all pavement layers and for all traffic conditions. They work well for structural, friction, leveling and patching needs. Other Info: Particulars about dense-graded HMA are covered by the rest of this Guide. 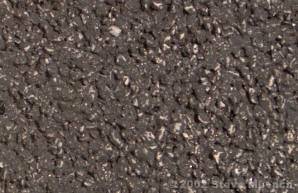 Stone matrix asphalt (SMA), sometimes called stone mastic asphalt, is a gap-graded HMA originally developed in Europe to maximize rutting resistance and durability (Figure 2 and 3). The mix goal is to create stone-on-stone contact. Since aggregates do not deform as much as asphalt binder under load, this stone-on-stone contact greatly reduces rutting. SMA is generally more expensive than a typical dense-graded HMA because it requires more durable aggregates, higher asphalt content, modified asphalt binder and fibers. In the right situations it should be cost-effective because of its increased rut resistance and improved durability. SMA, has been used in the U.S. since about 1990, although it has only been used in Washington State on several pilot projects. Purpose: Improved rut resistance and durability. SMA is almost exclusively used for surface courses on high volume interstates and U.S. roads. Other Info: Other reported SMA benefits include wet weather friction (due to a coarser surface texture) and less severe reflective cracking. 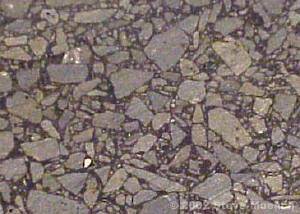 Mineral fillers and additives are used to minimize asphalt binder drain-down during construction, increase the amount of asphalt binder used in the mix and to improve mix durability. Open-graded friction course (OGFC). Typically 15 percent air voids and no maximum air voids specified. 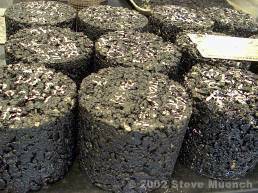 Asphalt treated permeable bases (ATPB). Less stringent specifications than OGFC since it is used only under dense-graded HMA, SMA or PCC for drainage. Open-graded friction course (OGFC) is not used widely in Washington State because of its susceptibility to studded tire wear. Tire studs will tend to dislodge aggregate from the mix in the wheelpaths causing a depression typically referred to as studded tire wear. From 2006 through 2009 WSDOT paved three test sections of OGFC to investigate its use as a “quieter pavement” and performance in Washington State. For the most part, these mix designs were taken from Arizona where they have been extensively used. 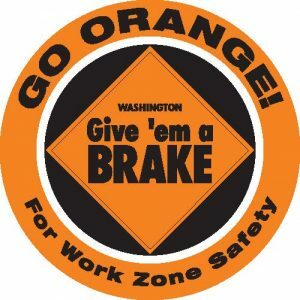 WSDOT information on these test sections can be found here. Purpose: OGFC – Used for surface courses only. They reduce tire splash/spray in wet weather and typically result in smoother surfaces than dense-graded HMA. 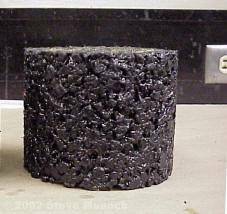 Their high air voids reduce tire-road noise by up to 50-percent (10 dBA) (NAPA, 1995).ATPB – Used as a drainage layer below dense-graded HMA, SMA or PCC. Other Info: OGFC is more expensive per ton than dense-graded HMA, but the unit weight of the mix when in-place is lower, which partially offsets the higher per-ton cost. The open gradation creates pores in the mix, which are essential to the mix’s proper function. Anything that tends to clog these pores, such as low-speed traffic, excessive dirt on the roadway or deicing sand, can degrade performance.